Near as I can tell from watching this form on the net, very few, if any, people know that it is actually a 2 person form - or more particularly, that it functions as a looping 2 person form where both sides do precisely the same sequence. On Youtube I see some people practising it with extra movements while some miss out certain movements altogether. Sometimes the movements are there, but are performed with the wrong emphasis.3 How do I know this? I feel that the kata's applicability as a 2 person set provides a litmus test. In some schools, 2 person application of this kata takes the form of well-executed sequential bunkai but not a 2 person set as such (see below, for example). In other cases there appears to be a "corporate memory" that the form can be practised as a 2 person set - however the means by which it should be rendered into a 2 person paradigm appear to have been lost. In those cases it is common to see the form practised against an RNA type "opposite side". In order to achieve this "fit", the "kata side" of the form is invariably modified as well. There is even one group that say they have "almost" worked out a 2 person continuous application of the form, but "there are slight differences between the side that goes first, and the side that follows". I admire their efforts but think they have some fundamental misunderstandings in relation to it. Once you understand the application of the form's techniques you will observe that it requires no modification at all to function perfectly as a 2 person looping set - ie. where both sides doing the same thing. 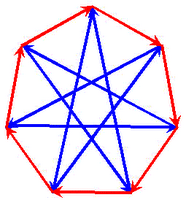 It is like an elegant puzzle or a mathematics equation; there is one and only one answer. My own teacher seemed aware of the correct 2 person application of this form because he described it as "a work of genius", hinting that it had "an extra dimension" (one which he never showed me!). In fact, I discovered this added dimension quite accidentally in early 1997 while training with my good friend Craig Dunlop at our now defunct Carine dojo. I had devised a series of bunkai of this jo form utilising the kata moves against each other. At one point during our practise Craig remarked to me that we had just done a full circle; both of us had just completed the kata during the bunkai practise, starting at different points. Craig thought I had done this on purpose, but of course I hadn't. Some years later I sent my instructor a video of the 2 person version of the jo form. He sent me back a smiley face. The revelation I had concerning this form has had a profound effect on my own curriculum; for one thing it has influenced me greatly in developing our embu, all of which are based on a similar template. Accordingly I think that the creator of the form had a near-perfect understanding of the destructive and constructive cycle of the 7 essential techniques that comprise the "13 count" jo form. I doubt the video at the outset communicates this complexity adequately; the principles are very subtle and are easily missed. However the form truly is a work of genius. It's a shame that so few people appear to be aware of the nature and extent of that genius. 1. The number of counts one uses in the form is not really important, however if one is to analyse the form by reference to the 7 point star of constructive and destructive cycles, 13 is entirely appropriate. I still call the kata "juroku" (16) because the added counts focus on some subtleties that might otherwise be missed. 2. It seems that the 13 count form as we know it was created by Morihiro Saito, a senior student of Ueshiba (see this interview). I have preserved the form exactly as it was taught to me with the exception of one small detail; at the very end of the kata there is a downward pressing deflection which I perform by moving my front leg backwards so that it becomes my rear leg, while the kata as it was originally shown to me has the front leg sweeping sideways. Both moves occur in the 31 count kata (sanjuichi) and at some point I subconsciously substituted the former for the latter. Having done so I am not motivated to change it back as it seems to work very well and ties in with a similar move in xingyi. 3. The biggest difference between most other schools' versions of this kata and how I was taught it lies in the deflection illustrated to the right. 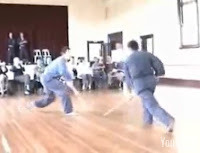 The way I was taught, you push your right hand up the jo as you "open door", effecting a pressure on the incoming thrust and deflecting it (chudan osae uke). This makes for a very subtle manouvre that slips the attack and places you in an ideal counter position. Correspondingly, your opponent finds your counter sliding over the top of his/her thrust. Given the immediacy of your counter your opponent simply does not have time to move backwards to evade you. This leaves your opponent just one option; to carry on his or her forward momentum straight into a jodan gaeshi uke(which is precisely what the kata does - see the series of 4 pictures above showing practise of this form on an open field). By contrast consider the more common version on the left (one to which all my students default by mistake - so I'm not surprised to see it everywhere). In this version, you move backwards and effect a circular "rubbing" (wax on/off) deflection with your jo. This might work as a defence but it does not place you in the prime position the above chudan osae uke does. For one thing, you've moved away from your opponent and now have to close the gap. That would be okay if you needed to move away, but the chudan osae uke option shows you that you don't. You can slip the technique quite effectively by opening your hips. Furthermore, when you move away from your opponent, there is nothing requiring your opponent to keep moving his or her momentum forward into a jodan gaeshi uke (as the kata dictates). In short, the more common "wax on/off" movement with a backwards evasion "disconnects" the moves in the kata. This one difference is likely the missing link that prevents most aikidoka from realising the 2 person application of this form. Dan, not specific to this post, but I wanted to say your blog is the most interesting set of insights into martial arts that I have read for a very, very long time. Thank you. Your encouragement and support are greatly appreciated. 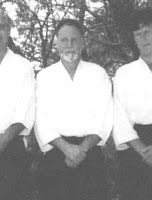 The 13 kata was created by Morihei Ueshiba sensei himself. "Although he didn’t use a one-two-three method he always taught us patiently and explained in detail what we should do. Mr. Tohei’s kata has a lower number count and so people say that he was taught in one way while I was taught in another way. But I’m not sure about that. O-Sensei also showed me different kata. However, I only remember half of them. The “13-movement jo kata” is one I created by imitating these kata I remembered." In other words, Saito only remembered half of the kata that Ueshiba taught. The 13 count kata was however not one of these "half-remembered" kata. It is Saito's. In my view there is no "other half" to Saito's 13 count form. It is a work of genius because it is complete and serves both sides in a 2 person performance. I think this is self-evident when you apply the form in a 2 person setting. It is too well constructed for this to be a "coincidence". Which leads - hand or body?